When I was a kid I had a few dolls that I had got from my parents. I never understood the fun in playing with them. Instead, I preferred to play with my brother’s cars, built cranes with his Brio Mec and cities with his Lego. The only own properties that I really liked to occupy myself with were my puzzles. Puzzles were apparently girlish enough to have my own ones. I even had a period when I had to do at least one puzzle every day before I went to the day care. All this was just the beginning of what was to shape me into the engineer type. When I was about 6 years old the computer came into my life. My dad borrowed a “portable” computer from work that I was unable to lift. Its screen had two colours, dark orange background and bright orange signs. I thought it was fantastic. I played games called Pacman and Frogger and I wrote on it. I wrote and wrote, completely pointless things, just to get to sit by the computer. For example, “Mommy is cooking, she has a red shirt today, now Dad came home, he said hi to mom.” I soon began to nag at my parents that they would buy a computer, but they thought it was too expensive. Then a summer day in 1990 my beloved father won a Commodore 64 in a running race. The happiness was complete! We had a computer at home and you could connect it to the TV and play games in different colours! My brother and I played every day. A couple of years passed and when we came home from Grandma and Grandpa late Christmas Eve 1992 there was a big box in the living room. On the box, we read “Merry Christmas to the Hägglöf family, from Santa Claus”. You can probably guess what the box contained … Well, there was no PC. Thanks to my old fashioned and stingy father there was a used Commodore 128 including monitor, disk drive and any other accessories you can imagine. The carton also included a book and with help from that book, I wrote my first Basic code in green signs. The little hacker is having a cold. Years passed and I still liked to build things even if I became too big for toys. When my parents bought furniture from Ikea, it was always me who put them together. When a cable would be deducted or dad had bought a technological gadget, I was always there to help with the installation. When I was 12 years old, we got a PC to the classroom at school. Since we didn’t have a PC at home I used to remain after school and sit by the computer in the classroom. Here is where my former teachers deserve thanks for allowing me to sit there. Middle school was worthless in every way. There was a computer classroom where we weren’t allowed to be and because we still did not have a PC at home, I didn’t have any computers in my life any longer. But my friend Johanna came to the rescue. 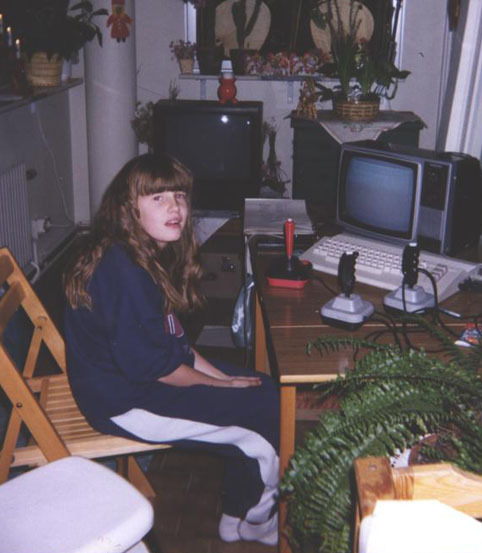 She had got Internet at home, the year was 1996 and we sat by her dad’s computer and chatted at aftonbladet.se. Oh, how I wished that we had a computer with Internet at home so I could explore the Internet alone, in peace and quiet. Autumn 1998 it finally happened, what I had longed for half of my life. My mom took a lease-PC through her work and we also got the Internet. I started chatting at IRC, used ICQ, downloaded MP3’s and build my first website. Internet became my life, fairly quickly, and when someone in the family had problems with the computer, I was there to solve it. This is what is left of my first website. When I finished high school, I had given much thought to whether I would continue studying economics (it was the numbers that made me choose economics in high school) or if I would choose something technical. After much reflection, I followed my heart and chose the Information Technology program at Mid-Sweden University in Sundsvall. At the university I learned more about programming and even though I understood that I don’t want to work as a software engineer, my interest in technology will always be a big part of my life. My interest in technology is the one of my interests that has characterized my personality the most and although I have many different kinds of friends that I like, it is with the company of my engineer friends I feel “at home”.